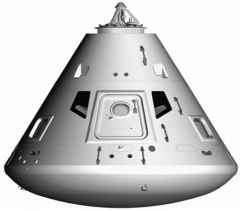 The command module was a stubby, conical craft almost entirely covered with a heatshield that was thickest across its base to sustain most of the punishment of re-entry. The outer rim of the cone was packed with small tanks, thrusters, various antennae and two small ports for the ejection of waste water and urine. 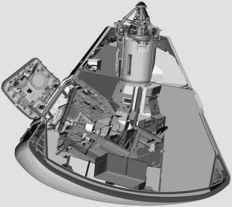 The apex of the cone had a removable probe mechanism to enable it to dock with the Apollo lander and a tunnel through which the crew could transfer between the two spacecraft. Parachutes were carefully packed around the outside of this tunnel, along with other paraphernalia of the Earth landing system. occupied the left couch for access to most of the flight instruments; the lunar module pilot (LMP) took the right couch and took responsibility for the spacecraft's systems, as this was where many of the relevant switches and displays were located; and the command module pilot (CMP) had the middle seat, with his head next to the spacecraft hatch. For major manoeuvres in space, the CMP occupied the left seat. 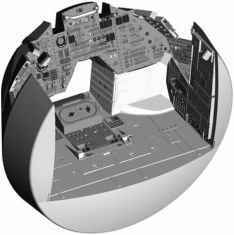 Directly in front of the crew and ranged around the entrance to the tunnel was the main display console - a vast panel of some 400 knobs, switches, meters and displays with which most of the flying of the spacecraft was achieved, in association with various hand controllers that sprouted from the ends of armrests. Above the console, in the eye-lines of the commander and LMP, were two small forward-facing windows. Other panels, windows and compartments were arranged around the crew. 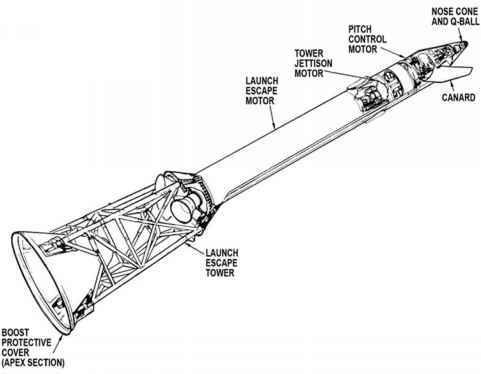 In particular, at the CMP's feet was the lower equipment bay which included all the gear he would need to navigate the spacecraft, a task for which he was responsible. provide the crew with not only electrical power, but also water good enough to drink. 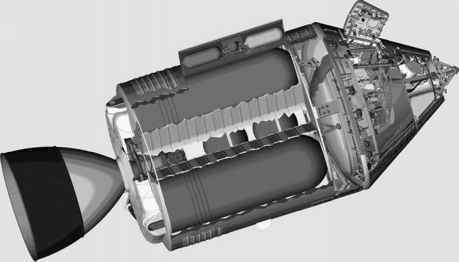 The oxygen tanks also supplied the CM's cabin air.